against Thief River Falls as the state's single-game record. More than 60 years after his final high school game, and three years after his death, Warroad’s Max Oshie still was making headlines with his hockey exploits. Three state high school players each had seven-goal games during the 2008-09 season. It was widely reported that all three (Ben Hanowski of Little Falls, Michael Unzen of Moose Lake and Dan Billar of Mankato East) had tied the single-game goal scoring record held by former Eveleth scoring machine John Mayasich. The publicity from that unlikely series of seven-goal games shook loose another, much older account of an even more mind-boggling scoring outburst. Turns out Oshie scored an amazing 12 goals against Thief River Falls on Jan. 6, 1948, according to a Warroad Pioneer article recounting the game. Adding validity to the report is Orv “Beno” Kofstad’s first-person account of the feat. “I was on the ice when he did it,” said Kofstad, a Warriors defenseman who, like Oshie, was a senior co-captain during the 1947-48 season. Kofstad, who went on to referee high school hockey for 30 years, said Oshie was as dominant as any of the dozen or so legendary players who suited up for Warroad in succeeding years. Oshie had above-average size -- he was a stocky 6-foot-1 -- to go along with exceptional stickhandling and skating ability. His combination of size and skills was rarely seen in the 1940s, when organized hockey in the state still was in its infancy. “He was a big guy, and you didn’t see big hockey players like that in those days," said Willard Ikola, the former Eveleth goaltender who faced Oshie and the Warriors in the championship of the 1948 state tournament. During his legendary run as Edina's head coach, Ikola led his Hornets against Warroad and Boucha, widely considered the best player of his era, in the championship game of the 1969 state tournament. Eveleth beat Warroad 8-2 for the championship that season. Oshie, who died in 2006 at age 78, scored a goal in the title game and finished the state tournament with five goals and four assists in three games. He was one of eight players named to the all-tournament team. 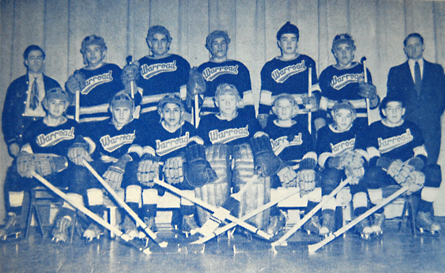 Warroad, making its first state tournament appearance, had just 12 players on its roster. Kofstad said he and Oshie never went to the bench during their three games at the St. Paul Auditorium, playing every minute of all three games. Oshie would line up at center to start a game, and he would “rest” by occasionally moving back to defense. 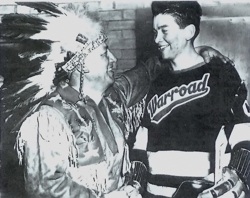 Tim Oshie’s Internet article, “A look back at the 1948 Warroad Warrior hockey team” quotes Max extensively. “It was the greatest feeling playing for Warroad High School, the city, and all the fans. I'll never, ever forget the feeling skating in front of so many people. The big city of St. Paul and all the tall buildings. I'd never seen (buildings) like that before and St. Paul had so many of them," Max Oshie said in the interview with his nephew. Upon returning to Warroad, the hockey team was greeted with a rousing reception. Tim Oshie said Max Oshie was recruited by both the University of Minnesota and the University of North Dakota. Oshie worked out at the University of North Dakota in the summer of 1948. He also had a tryout with the U.S. national team in 1948 before eventually joining the Air Force that year. Max Oshie’s great-nephew, T.J. Oshie, led Warroad to two state Class 1A championships and plays for the St. Louis Blues.